The user's General tab defines basic settings for the user. Users can be in zero or more Groups. 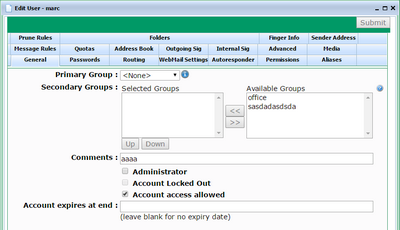 In VPOP3 a Group is a sort of List which is also used for assigning permissions and settings. If you are simply wanting a 'distribution group', then in VPOP3 add the users to a Distribution List instead. Doing this is done in the List settings, not in the User settings. The Primary Group allows you to override user settings by group if you wish. 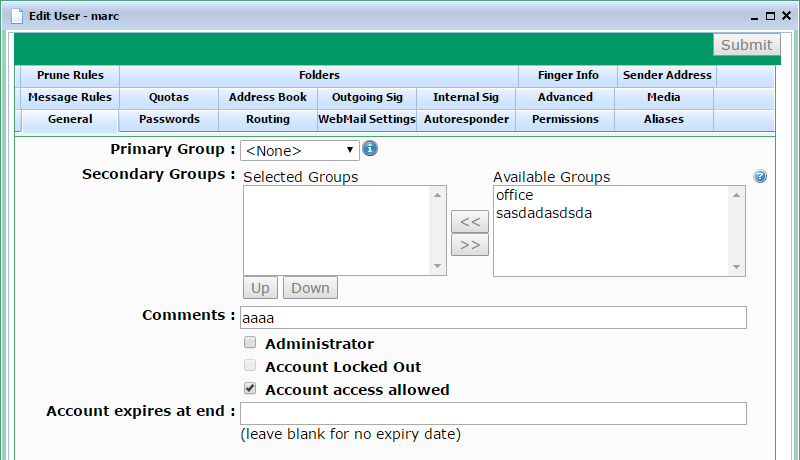 The Primary Group has settings such as permissions which can override individual user's settings. This means that you can change the settings for a group of users in one action rather than individually. However, note that the Bulk Edit option may achieve a similar result and be easier to understand in many cases. A user can only be in one Primary Group. Secondary Groups do not allow you to override user settings but are used for permissions for IMAP4 folder sharing (and maybe used for other permissions in the future). A user can be in multiple Secondary Groups. The Comments box lets you assign a comment to the user for future reference. This can be viewed in the main Users list. The Administrator box lets you indicate that this user is a VPOP3 administrator. Any user can be an administrator. Administrators have permission to log into the VPOP3 settings (using their own username & password details). When VPOP3 is first installed an initial administrator is created (usually called 'postmaster'). This initial user is no different from any other user who has been set as an administrator, so can be deleted in the future (you need to log in as a different administrator first, because an administrator cannot delete themselves or set themselves to not be an administrator). The Account Locked Out box cannot be checked manually. If VPOP3 detects several bad login attempts from an IP address it will lock the account for a period of time so that it cannot be logged into from that IP address. In that case the Account Locked Out box will be checked and VPOP3 will display the locked IP addresses. You can uncheck the box and press Submit to remove the account locks. Note - if the account is locked, any attempts to login will result in a generic 'Login failed' type error message. If you get a Mailbox Locked error when trying to login using POP3 or IMAP4, that does not mean that the account is locked. Each mailbox has an exclusive-access lock which is required to meet the POP3 standards, any POP3 client will attempt to acquire this lock and the first IMAP4 client to access the mailbox will also attempt to acquire this lock. Mailbox Locked means that this exclusive-access lock has already been acquired by another email client. Check the Status → Active Sessions view to see which other computer is already logged into the mailbox. The lock is released when the POP3 client logs out, or the last IMAP4 client logs out. The Account access allowed box means that the account is active. If you want to disable the account then uncheck the box (incoming mail to the mailbox will still be accepted, but the user will not be able to collect it or perform any other actions which require them to log in). The only exception is that if the user is a VPOP3 administrator, they will be able to log into the Web interface (this is to prevent you accidentally locking yourself out). If you stop the user being an administrator as well, then they won't be able to log into the web interface either. The Account expires at end box lets you set an expiry date for the account (for instance for temporary accounts). The account will become inactive at the end of the specified day. It will not be deleted at that time. If you click on this box a calendar will be displayed so you can select a date. Inactive accounts are displayed in grey on the main Users list.